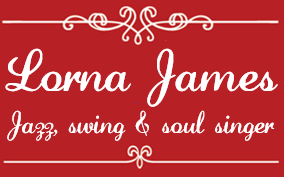 Lorna offers solo gigs based on well-known classic tracks from jazz and swing performers, including Ella Fitzgerald, Nina Simone, Peggy Lee, Louis Armstrong, Dinah Washington, Etta James, Frank Sinatra, and more. Her soul repertoire includes hits by Al Green, Marvin Gaye, Gladys Knight, Randy Crawford, Alison Moyet, Norah Jones and many others. She also covers Cher, The Carpenters and even Elvis! Lorna fronted a Eurythmics tribute band for several years, still sings their songs, and is an ardent Annie Lennox fan.